Sat., 20 Jul. 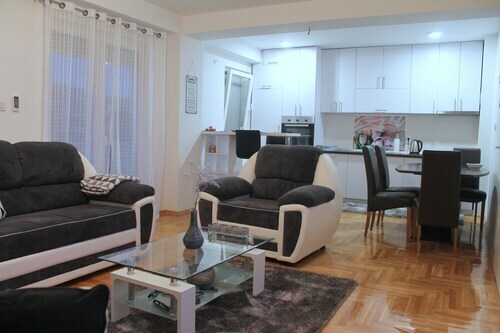 - Sat., 3 Aug.
See all 13 properties in Banja Luka Intl. Situated in Laktaši, this hotel is within 12 mi (20 km) of Hram Svete Petke u Kuljanima, Grand Trade Banja Luka, and Orthodox Cathedral of Christ Saviour. Orthodox Sanctuary of Christ the Savior and Park Petar Kocic are also within 12 mi (20 km). Situated in Laktaši, this hotel is 4.8 mi (7.7 km) from Hram Svete Petke u Kuljanima and within 12 mi (20 km) of Grand Trade Banja Luka and Orthodox Cathedral of Christ Saviour. Orthodox Sanctuary of Christ the Savior and Park Petar Kocic are also within 12 mi (20 km). Situated in the suburbs, this boutique hotel is 7.2 mi (11.6 km) from Park Petar Kocic and 7.3 mi (11.8 km) from Banja Luka Castle. Located in the heart of Banja Luka, this hotel is within 1 mi (2 km) of Grand Trade Banja Luka, Orthodox Cathedral of Christ Saviour, and Orthodox Sanctuary of Christ the Savior. Park Petar Kocic and Banja Luka Castle are also within 2 mi (3 km). Banja Luka Station is 16 minutes by foot. Situated in Banja Luka, this hotel is within 6 mi (10 km) of Hram Svete Petke u Kuljanima, Grand Trade Banja Luka, and Orthodox Cathedral of Christ Saviour. Orthodox Sanctuary of Christ the Savior and Park Petar Kocic are also within 6 mi (10 km). Situated in Banja Luka, this hostel is within 3 mi (5 km) of Grand Trade Banja Luka, Orthodox Cathedral of Christ Saviour, and Orthodox Sanctuary of Christ the Savior. Park Petar Kocic and Banja Luka Castle are also within 3 mi (5 km). Banja Luka Station is 24 minutes by foot. Double Room in Hostel "room"
Situated in Banja Luka, this hostel is within 3 mi (5 km) of Grand Trade Banja Luka, Orthodox Cathedral of Christ Saviour, and Orthodox Sanctuary of Christ the Savior. Park Petar Kocic is 2.8 mi (4.5 km) away. Banja Luka Station is 29 minutes by foot. Situated in Banja Luka, this historic property is within 1 mi (2 km) of Grand Trade Banja Luka, Orthodox Sanctuary of Christ the Savior, and Orthodox Cathedral of Christ Saviour. Park Petar Kocic and Banja Luka Castle are also within 2 mi (3 km). Banja Luka Station is 27 minutes by foot.